A vertical integration is when a firm extends its operations within its value chain. It means that a vertically integrated company will bring in previously outsourced operations in-house. 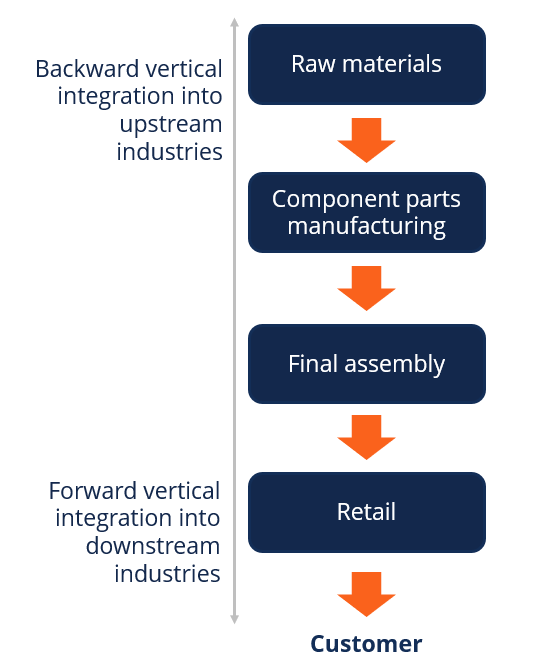 The direction of vertical integration can either be upstream (backward) or downstream (forward). This can be achieved either by internally developing an extended production lineEconomies of ScaleEconomies of Scale refer to the cost advantage experienced by a firm when it increases its level of output.The advantage arises due to the inverse relationship between per-unit fixed cost and the quantity produced. The greater the quantity of output produced, the lower the per-unit fixed cost. Types, examples, guide or by acquiring vertically. Obtaining all the assetsTangible AssetsTangible assets are assets with a physical form and that hold value. Examples include property, plant, and equipment. Tangible assets are seen or felt and can be destroyed by fire, natural disaster, or an accident. Intangible assets, on the other hand, lack a physical form and consist of things such as intellectual propertyr, resources and expertise needed to replicate the upstream or downstream member of the supply chain. Obtaining some stake in the supplier in the form of specialized investments or an equity stakeStockholders EquityStockholders Equity (also known as Shareholders Equity) is an account on a company's balance sheet that consists of share capital plus retained earnings. It also represents the residual value of assets minus liabilities. By rearranging the original accounting equation, we get Stockholders Equity = Assets – Liabilities to obtain agency benefits by increasing the ownership in the outcome. A diluted form of vertical integration in which some elements of procurement are held constant to reduce inconsistencies in product delivery while holding costs constant to a certain extent. The point to which a firm is not vertically integrated is when the firm relies on spot contracts to receive the immediate input necessary for its production. The direct benefits of pursuing vertical integration are greater control over the supply chain and lower variable production costs. Information and product delivery experience lead times within a supply chain. In other words, there is a delay between conveying the information or supplies between the different members of a supply chain. It creates and an effect that is known as the Bullwhip Effect, where information relating to the quantity demanded by the customer is amplified along the supply chain such that the manufacturer overreacts to the actual information. By vertically integrating, greater control over production process is achieved in the sense that information flows more freely between the different supply chain members. As a result, this allows for greater flexibility in adapting to changes in demand, which improves the elasticity of supply. In a perfectly competitive market, goods and services are traded at costs. However, most markets face some level of imperfection that allows for increased profits due to either branding, information asymmetry, market power or other factors. As a result, the price for which a company acquires its resources is often at cost plus margin. Through vertical integration, the company is able to reduce these input costs by the margin. In reality, the prices of input do not fall by an amount equal to the margin but within some range between the costs of production and market prices. Transfer pricingTransfer PricingTransfer pricing refers to the setting of prices of goods and services that are exchanged between commonly controlled legal entities within an describes how two vertically integrated entities set a price for exchange while the overall entity internalizes the net benefits. One of the primary reasons for vertically integrating is the increase in managerial complexity. This is because entering a new line of work requires a new set of expertise to complement the existing business. A clear result of this is the increase in divestitures to return a company to its core competency. One instance of increased managerial complexity being a disincentive for vertical integration was when Exxon Mobil (NYSE: XOM) contemplated operating convenience stores alongside its gas stations. This is because moving into the management of retail outlets would require a new set of expertise, acquiring new suppliers and managing the new line of business. Eventually, they did take on this forward integration but not without considering the difficulties of the integration. Some companies are able to gain a competitive advantageCompetitive AdvantageA competitive advantage is an attribute that allows a company to outperform its competitors. Competitive advantages allow a company to achieve through vertical integration, whereas others instead opt to develop more efficient ways to manage their supply chain and input costs. It depends on the tradeoff of benefits and costs of integration. SpaceX is the modern example of using vertical integration to lower the costs of its deliverable. By producing the majority of its components in-house, it is able to undercut the costs of its primary competitor, United Space Alliance. United is a joint partnership between Boeing (NYSE: BA) and Lockheed Martin (NYSE: LMT). SpaceX enjoys several advantages over United, because of the latter’s dispersed supply chain where various suppliers were producing at cost plus a profit margin, resulting in an inflated cost of approximately $460 million per launch. In contrast, SpaceX’s cost is $90 million per launch, which is also falling due to its reusable design. Alternatively, McDonald’s (NYSE: MCD) is known for its very dispersed supply chain due to its franchising business model. Instead of pursuing a vertical integration strategy, it uses a robust communication system between its managers and external suppliers. Part of this system is a crowdsourcing platform where various suppliers are able to share ideas and improve on individual processes and efficiency. 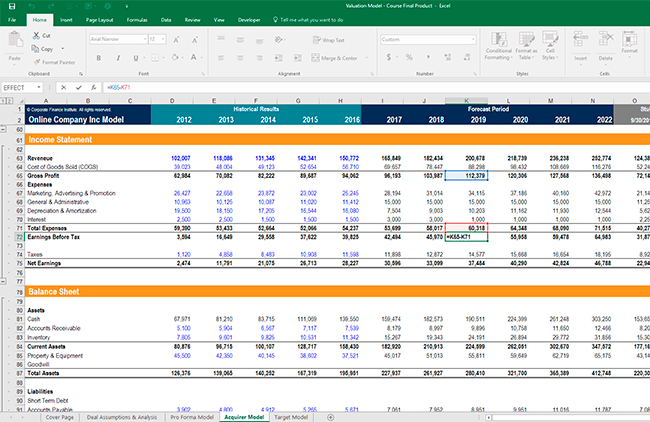 A financial analyst performing financial modelingWhat is Financial ModelingFinancial modeling is performed in Excel to forecast a company's financial performance. Overview of what is financial modeling, how & why to build a model. A 3 statement model links income statement, balance sheet, and cash flow statement. More advanced types of financial models are built for valuation, plannnig, and and valuation of a business should incorporate the potential synergiesTypes of SynergiesM&A synergies can occur from cost savings or revenue upside. There are various types of synergies in mergers and acquisition. This guide provides examples. A synergy is any effect that increases the value of a merged firm above the combined value of the two separate firms. Synergies may arise in M&A transactions (cost savings) that could arise from vertical integration. If the integration happens as part of a merger or acquisitionMergers Acquisitions M&A ProcessThis guide takes you through all the steps in the M&A process. Learn how mergers and acquisitions and deals are completed. In this guide, we'll outline the acquisition process from start to finish, the various types of acquirers (strategic vs. financial buys), the importance of synergies, and transaction costs, the analyst will build an M&A model in Excel and factors in the cost savings that result. Watch this short video to quickly understand the main concepts covered in this guide, including what vertical integration is, the types of vertical integration, as well as the pros and cons of performing vertical integration. Thank you for reading this article on vertical integration. To learn more about corporate-level strategies, enroll now in CFI’s Corporate & Business Strategy Course to deepen your knowledge!